Blocks old, unused thimble holes in masonry chimneys. Provides a thermal break from combustibles and prevents downdrafts from entering the room. Constructed of a ceramic based fireproof insulating material. 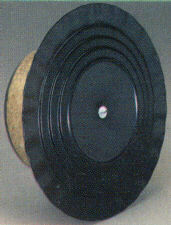 The black outside plate covers up to a 10" diameter hole. Installs easily, simply insert the plug into the old thimble opening and tighten the expansion screw on the face of the plug. The side expand and create a tight fit inside the thimble opening. To remove simply reverse the process. 6" plug adjusts from 5 3/4" to 6 1/8"
8" plug adjusts from 7 3/4" to 8 1/8"